Carte de L'Empire D'Alemagne avec les Etats de Boheme. 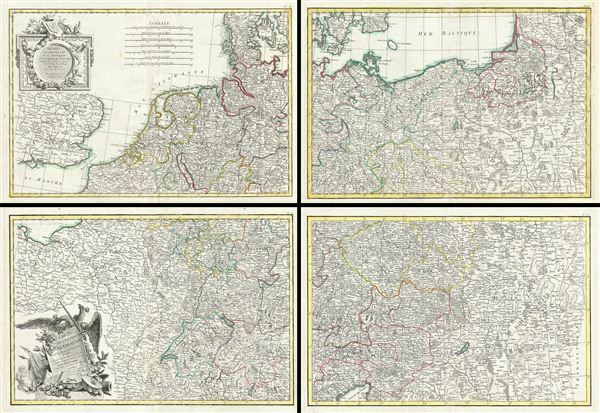 A rare compete example of Rizzi-Zannoni's 1783 decorative four panel map of the German empire and Poland. Rizzi-Zannoni's map covers from Jutland to the Gulf of Venice and from england to Poland. The map offers excellent detail throughout showing mountains, rivers, forests, national boundaries, regional boundaries, forts, and cities. A large decorative title cartouche depicting the janiform Reichsadler (Imperial eagle) appears in the lower left quadrant. The upper left quadrant bears a secondary cartouche and dedication. each of the four maps measures 12.5 x 17.5 inches - size below represents a composite. This unusual map takes on a dramatic aspect when framed and presented as a four part whole. Drawn by Rizzi-Zannoni c. 1783 for issue as plate nos. 14 - 17 in Jean Lattre's 1783 edition of the Atlas Moderne. Very good condition. Original centerfolds exhibit toning. Blank on verso. Platemarks visible. Four sheets. Rumsey 2612.036. Phillips (Atlases) 664. National Maritime Museum, 215.